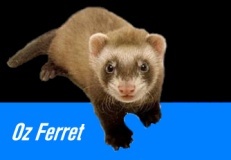 For accurate information regarding the care of ferrets, be sure to visit your states ferret welfare society website. These can be found by clicking a state above. These groups have details information available on their sites. Letting Go - When euthanasia is required for your ferret. Harness Training - Some tips to help your harness train your fuzzy. Ferret Diet - What is a good diet for your fuzzy. Site copyright © Ken Moore 2004-2008.